We were in a mission this morning to make our reservation on the first ferry crossing to Liberty Island to see great Lady Liberty, so a swift breakfast was in order. Dunkin Donuts met our brief and so we briefly admired their Halloween donut names and grabbed our donuts and coffee to go. 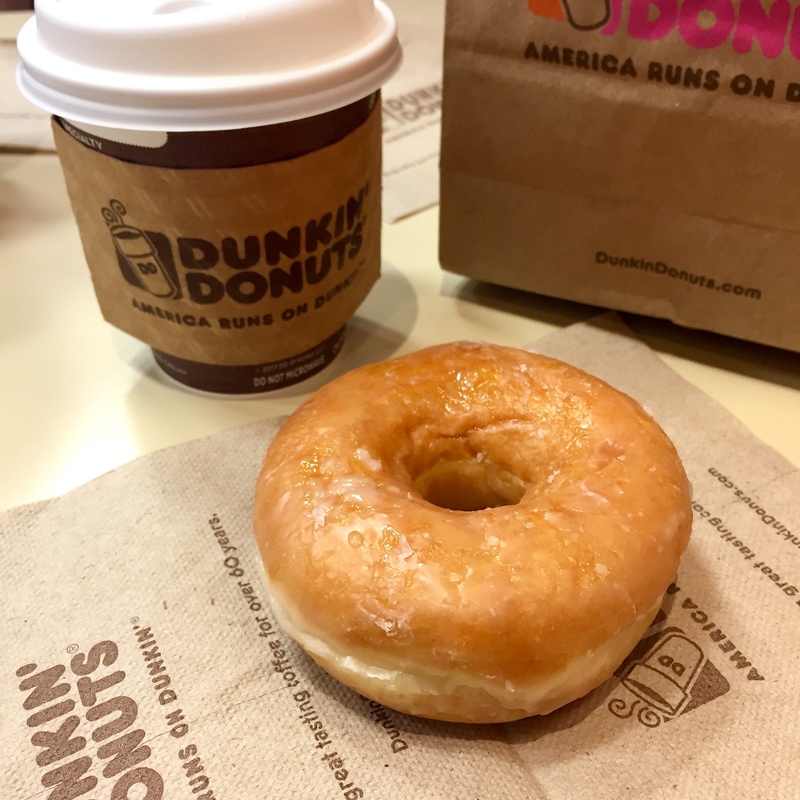 Mine was the “Ghoulish Glazed” donut…which of course was just a glazed donut – an oldie but a goodie! We probably picked the coldest day of our trip to take the ferry out on the Hudson, and even though we wrapped up, it was still biting first thing. The views from the ferry are gorgeous, but I enjoyed them from the covered deck rather than enduring the cold harbour wind for the photo opportunity. Thankfully it warmed up over the day. 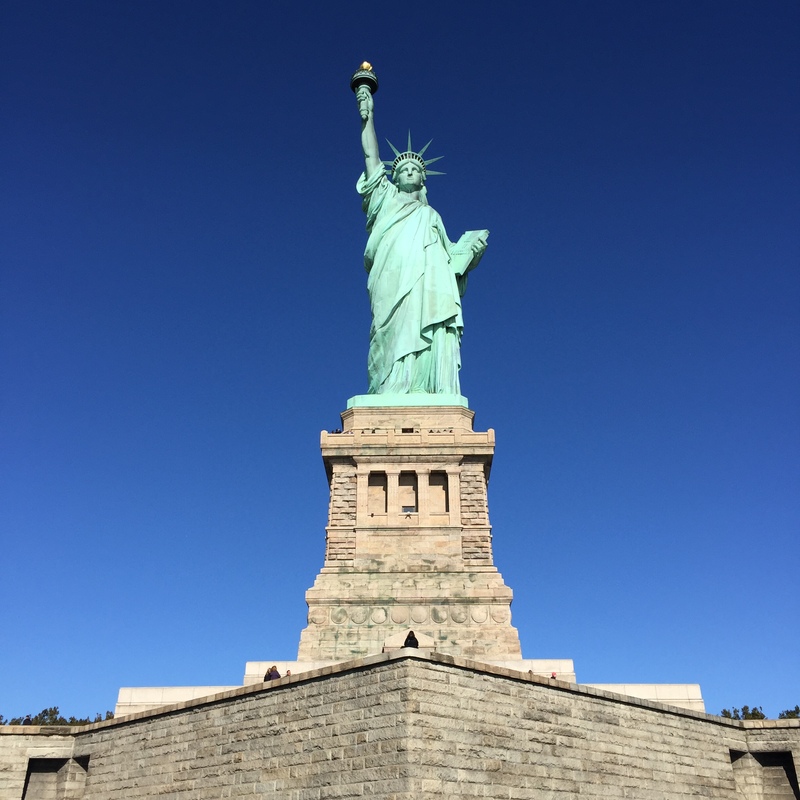 Everyone knows what it looks like, but the Statue of Liberty is stunning when you see it in the flesh. On Liberty Island we picked up audio guides that were included in the ferry ticket price and had some interesting titbits about the statue’s origins and construction. It didn’t take long to walk around the island to see the statue and take our snaps as we didn’t get tickets to go into the pedestal or the crown. Crown tickets are tricky to come by, and it’s not obvious to me what you get out of going up the pedestal that you don’t get just walking around the island. 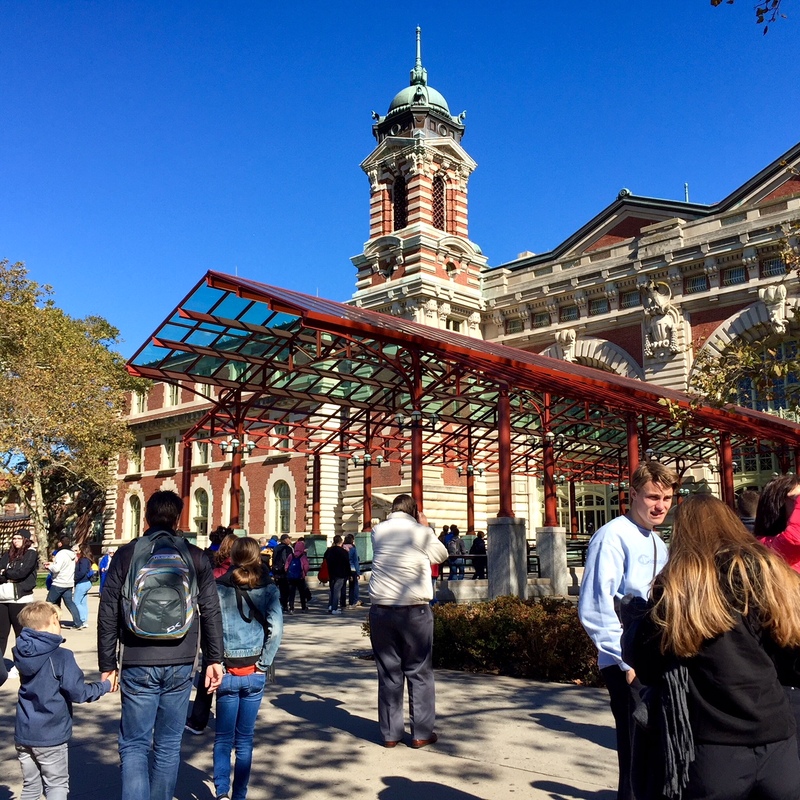 The next stop on our ferry tour was Ellis Island, where immigrants arriving by ship wishing to enter the US used to be processed. The building itself is actually really beautiful, but the museum inside was the highlight for me. Focusing on immigration over the years, the “Peopling of America” exhibit maps out periods of immigration over time, and push and pull factors for different groups. The museum also takes you through a series of small rooms detailing the painstaking process that a person would go through before being allowed in the US. It’s really interesting stuff and well worth the visit. Just before hopping back on the ferry back to Manhattan, we took a few photos of the incredible view back over the water. On our way back from the ferry at Battery Park, we grabbed a sneaky hot dog lunch and made our way back through Wall Street and the financial district. We passed the iconic Charging Bull sculpture, the New York Stock Exchange, and the Federal Hall which was built as New York’s City Hall but later became the first US Capitol building. We started on a on architecture walking tour in our Lonely Planet guide book, but my phone decided to switch off and show no signs of switching back on, so we had to abandon the walking tour and make haste to the Apple store on Fifth Avenue. We met a lovely chap in the Apple store and after a bit of TLC I was back online and with my photos all still intact – phew! By that point we needed to hot-foot it to Grand Central Terminal to get a train out to Croton-on-Hudson for the Great Jack O’Lantern Blaze. This collection of carved pumpkin lanterns draws crowds from across New York and for good reason. The skill of the carving and scale of the event is incredible with glowing pumpkins stretching out across the grounds of Van Cortland Manor and formed into huge sculptures including a pumpkin replica of the Statue of Liberty! Even the gift shop was worth the trip upstate – we came away with a gorgeous painted pumpkin bauble and a bunch of foodie pumpkin gifts for family. We finished our evening sat amongst pumpkins and hay bails with a cup of warm butternut squash soup.